and we pay you in full before we leave. Selling your car privately can be a stressful, expensive and time consuming experience, you have to advertise that your vehicle is for sale and wait for potential customers to contact you wanting to buy your car. A lot of these people may not be serious about wanting to buy any car at all or may offer to buy your car but at unrealistic prices. Added to this there is the worry of letting someone you don't know and have never met to take your car for a test drive. Thankfully there is an easier solution – why not let Money4yourMotors buy your car. We buy hundreds of cars every month and we can buy any car today. We have made the process of selling a car easy, in fact if you would like us to buy your car then you are just 3 steps away from Money4yourMotors buying your car today! Firstly, submit your vehicle's registration into the number plate at the top of the page and click 'Get Valuation'. Our system will then fetch your car's details for you to check. We then just need a few additional details from you including the car's current mileage and your contact details. Once you have submitted the required information an initial on-screen valuation for your car will immediately be calculated for you. Our policy is that 'we come to you' and so this appointment will take place at a time and place convenient to yourself. Remember that we will buy any car today and we come to you at a time and place convenient for you (usually your home, but we can come to your workplace). This means that when we do buy any car you don’t have to drive your car to us and then have the expense of travel costs to get back home. When we do buy any car the customer is paid by instant bank transfer and the payment will be made before we leave the premises. At this point the car becomes the property of Money4yourMotors, and we will aim for the car to be collected within five working days. By using Money4yourMotors we can buy your car today quickly and easily. 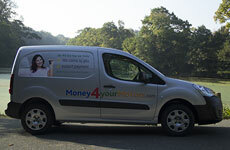 Money4yourmotors gave us a better quote and it was very stress free. We still had some finance on the car which they paid out of our offer so no hassle there and the money was in the bank within the hour. Would highly recommend you choose these guys over we buy any car. Very smooth, organised and efficient service. The gentleman who came to complete my valuation was punctual and extremely polite. I would definitely recommend this company to anyone looking for a truly professional service. True meaning of customer service. You may get more money selling it privately but I spent more time on the phone and with viewings. I had the car listed for over a month and many viewings simply wasted my time. I listed my car with money4yourmotors.com, got a reasonable offer (better than webuyanycar) and received a call the following day to book my appointment. I recommend selling with money4yourmotors. Having found myself without a licence due to health reasons I had to sell my car. After getting quotes from various car buying websites I decided to contact money4yourmotors and got a visit from a representative within two days who was very helpful and gave me a fair price, the money was in my account in minutes. Very easy and very professional. Excellent professional service. Got quote online then arrived at my house same day, looked over car and offered slightly less than quote due to damage but got more than we buy any car were offering (and only slightly less than private sale would have got me). Cash in bank in 5 minutes, keys handed over, they even collected car in 24 hours. Well happy!!! Turned up as promised. Very efficient book work and very detailed review of the condition of car. Very careful check of completeness of vehicle. Waited for evidence of money actually in my account before taking away documentation. Promised to collect car in 5 days - collected following day. Amid all the brouhaha and awards bestowed upon the Volkswagen Golf Mk V, the launch of the Golf Plus escaped some people. Those that did pay attention can be excused for being a little confused about this model's raison d'etre. Sitting on the same wheelbase as the Golf and being no longer or wider, the Golf Plus isn't at first an easy car to get to grips with. Family motorists who sample one may well appreciate its charms, however, and used models are, if anything, slightly undervalued. This means that if you want all the practical qualities of the Golf and a little bit more, it needn't cost the earth. Here's what to look for. The Volkswagen Golf Plus landed in UK dealerships in Spring 2005 to almost universal apathy, the standard hatchback model outselling it by a ratio of more than twenty to one. The Plus majored on the utility end of the engine line up, kicking off with the 80PS 1.4-litre petrol unit and a more advanced 115bhp 1.6-litre FSI unit. 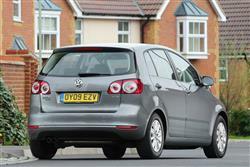 The diesel options were 90 or 105bhp versions of the 1.9TDI engine or a more modern 140bhp 2.0-litre TDI. Realising that perhaps the range could use the benefit of a little extra pizzazz, Volkswagen subsequently added the 150bhp 2.0-litre FSI engine before replacing that in summer 2006 with the 1.4-litre TSI twincharge engine, fitted with both turbocharger and supercharger. To complicate matters, Volkswagen introduced a second 1.4 TSI engine towards the end of 2007. This 120bhp unit lacked the supercharger of the other 1.4 TSI engine, making do with a turbocharger and it replaced the 1.6 FSI unit. The BlueMotion derivative arrived around the same time with aerodynamic tweaks and other modifications to enhance fuel economy. So let's look a little closer at the thinking behind this car. Statistics show that we're close behind the Dutch as the second tallest nation on earth. We're bigger than all the Scandinavians and the Germans. The Americans are growing out rather than up, but at current estimates, we'd still need at least a century or so before the average British male's head started to brush the plush head lining of the Volkswagen Golf Plus. Even given Volkswagen's build integrity, it's tough to see too many Golf Pluses plying the roads in the early 22nd century. Where is the benefit in having all this extra height? It increases the frontal area of the car and is rarely beneficial when loading. Volkswagen had a ready answer to this, pointing to the fact that overall load space went up to 505 litres, but how often have you loaded your hatch brim full to the ceiling? It's doubtless beneficial for awkwardly sized items like bicycles but the additional carrying capacity of the Golf Plus should be taken with a pinch of salt. Where it does score real practicality benefits is in terms of its seating arrangement. Thankfully, Volkswagen didn't try to squeeze seven seats into this vehicle, positioning it (as its name suggests) between Golf and Touran but a good deal closer to Golf. The rear seats can be shifted fore and aft by 160mm and folded by means of a system whereby they are automatically lowered when folded down. This results in a virtually level load space, making the Golf Plus a very practical option indeed. The seats do the usual 60:40 split and the middle seat can also be folded down to form a drinks table. Additional stowage spaces around the cabin and a double height boot floor are nice touches but once again, the Golf Plus generated more questions than answers. All of these features could easily have been engineered into the standard Golf. In many respects Volkswagen ran into the same sort of customer resistance Ford faced when launching the Fusion, a car that sat on Fiesta underpinnings but was a little taller, uglier, noisier and less adept in its handling. Volkswagen claimed the Golf Plus was likely to attract buyers without families, or possibly with small families, who require more room and flexibility than the traditional hatchback could offer. The sales figures haven't yet borne this assertion out. Keep a look out for cars that have been flogged by corporate users and ensure that servicing has been attended to diligently. The entry level petrol and diesel engines are best avoided as the Golf Plus is quite a weighty thing and they struggle to move it with any real conviction. Check for kerbed alloy wheels as replacements are expensive. If looking at a car with the DSG transmission, check that the system engages reverse gear silently and smoothly. (approx based on a 2006 Golf Plus 1.4 ex Vat) An exhaust system is about £95. 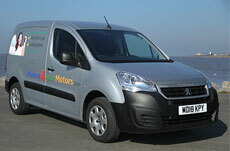 A clutch assembly will be around £75 and an alternator should be close to £115. Brake pads front and rear are about £55 and £45 respectively. One benefit of basing the Golf Plus on the Golf Mk V chassis was that it had an excellent start to life, the electro-mechanical steering feel and composed body control being leagues ahead of most of the opposition. The interior kept the Golf Plus at the top of the family hatch tree. It uses a fascia design reminiscent of the Phaeton luxury saloon although the centre console is lifted from the Touran mini-MPV. With the possible exception of its pricier Volkswagen Group cousin, the Audi A3, the cabin has the beating of any hatchback out there as regards ambience. The interior features soft-feel slush-moulded plastics, high-quality switches, subtle use of chrome, fabric-covered A-pillars plus blue instrument backlighting with red needles, a signature of the fourth generation Golf. The Golf Plus also features 2Zone climate control and four-way lumbar support within the line-up. In addition, ESP (Electronic Stabilisation Programme), no fewer than six airbags as well as anti-lock brakes will be fitted as standard throughout the range. Big car features such as automatic activation of headlamps and wipers are built into the car's electronics. Most buyers went the turbo diesel route, the 2.0-litre TDI being especially impressive. This engine will punt the big-boned Golf Plus to 60mph in just over 9 seconds and on to a top speed of just over 120mph, making it a brilliant long distance cruiser. The 103bhp unit is no slouch though and will get to 60mph in around 11.5 seconds and top out at over 110mph. It has also proved the bigger seller. Fuel economy of both engines is excellent, both units capable of eking over 50mpg from a gallon of heavy oil. The 1.9-litre car was fitted as standard with a five-speed gearbox but the 2.0-litre TDI got six cogs as standard. Both also got the option of the revolutionary DSG twin-clutch sequential gearbox. What's been a rare miss for Volkswagen as a new car becomes a smart piece of business as a used buy. If you feel that you could benefit from the added space and utility features the Golf Plus offers, now is a decent time to buy before the rest of the market catches on.